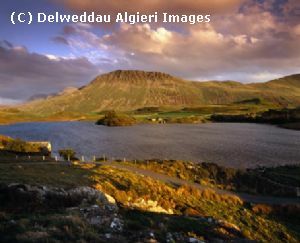 The caravan park is in a quiet and scenic location near Dolgellau in Snowdonia, Wales. The caravan park is set on a farm just outside the market town of Dolgellau in the Snowdonia National Park in Wales. 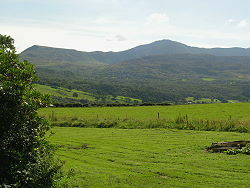 It is surrounded by beautiful mountain scenary and is close to the mountain of Cader Idris. You can just relax on the park enjoying the views and mountain air, wander around the interesting town of Dolgellau, or explore some of the many attractions and natural beauty of the Snowdonia National Park. From the map above it can be seen that the caravan park is ideally located for visiting the many tourist attractions of Snowdonia, such as Harlech Castle, Portmeirion and the Ffestiniog and Tal-y-Llyn Railways. There are also many activities to be enjoyed include walking and climbing in Snowdonia, and mountain biking at the world famous Coed-y-Brenin mountain bike centre. You can walk from Dolgellau to Barmouth along the estuary as featured on 'Railway Walks' on the BBC. There are also watersports such as kayaking, canoeing, windsurfing and sailing. Other sports and activities include golf and horse riding. The Cardigan Bay coast is not far, with its sandy beaches and stunning views towards the Lleyn Peninsula. The resorts of Barmouth and Aberdovey are within easy reach. There are plenty of shops and places to eat in Dolgellau which is the local market town. See the Find Us page for location map and route planner. Content is copyright Maelan Caravan Park, Dolgellau, Snowdonia, Wales UK.